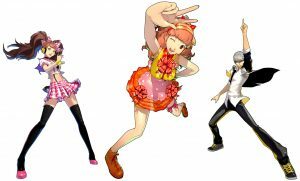 Funky Student isn’t funky enough to bust a move with Rise and the rest of the Persona 4 crew in Persona 4: Dancing All Night for the PlayStation Vita handheld entertainment system. The summer following the events in Persona 4 sees Rise return to Inaba after spending the summer back in her old life as an idol. After hearing rumors about the Midnight Stage, she checks a certain website at midnight and sees a mysterious movie clip and, you guessed it, winds up on the “other side.” Worse yet, she finds out her junior idol peers from the group Kanamin Kitchen are missing as well. She has no choice but to send an SOS to the Investigation Team to help rescue the missing idols. Not even Riddle-senpai could have seen this twist coming: Normal battle tactics don’t work against the Shadows on the Midnight Stage, but dancing does! Rise, the Protagonist, and the rest of the Investigation Team will have to dance their way to victory. 30 pulse-thumping tracks make up the new Persona Sound in this rhythm-based action game. P4DAN is made in collaboration with Dingo Inc., the company behind Hatsune Miku: Project DIVA.